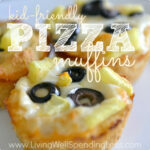 These pizza muffins are super easy and perfect for a quick lunch or afternoon snack! Unroll biscuits and separate the layers in half so that you have 16 half-biscuits. Place biscuits in muffin tins. Spoon pizza sauce over biscuits. Bake at 350 degrees for 16-18 minutes, until biscuits are golden brown and cheese is melted and bubbly. Serve immediately.